Playing catch up (once again!) with the theme from way back in June. There were quite a few military and armed forces inspired images from the Singapore National Day Rehearsal that I thought of using for this particular theme. A number of them would have conveyed the essence of the theme quite well without any additional editing or processing. Instead I chose to use an image that would need some processing to make the cut. 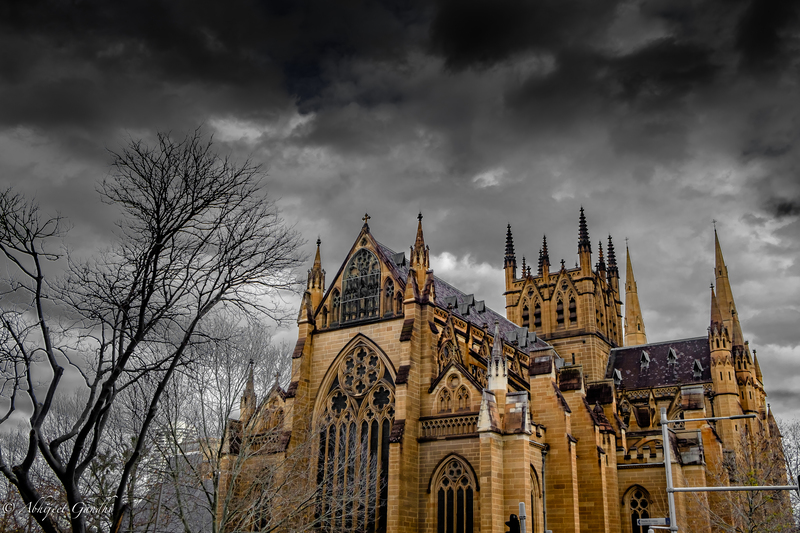 The structure in the image is St. Mary’s Cathedral near Hyde Park in Sydney. A magnificent structure, the cathedral attracts tourists from all over and is a hot spot for photographers especially the wedding and prenup specialists. However I felt that the imagery could be manipulated to render this holy building into a tad more unnerving and well hostile. Since it was overcast the day I shot the image, the skies above the cathedral gave me the idea to darken the skies with a little desaturation and the gradient tool. The end result makes the holy cathedral look a little like the Bates Motel! Well at least a “hostile” haunted cathedral.